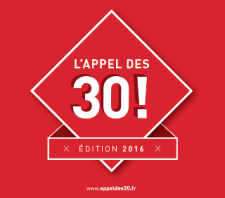 Home > Posts > News > Events > Lyon Metropole launches the 2016 edition of the Appel des 30! Lyon Metropole launches the 2016 edition of the Appel des 30! On 1 September, Lyon Metropole and its partners will be launching the 2016 edition of the Appel des 30 (‘The Call of the 30’). Targeting developers with innovative industrial projects in the chemicals, energy, environment and cleantech sectors, it enables candidates to take advantage of optimum conditions for setup and growth, co-enabled by the Lyon metropolitan area’s public- and private-sector partners. Mobilized by Lyon Metropole, 30 private- and public-sector players are actively involved in a development and planning project for Chemical Valley, through a large-scale effort to renew the area’s economy and land resources, which are strategic for the region. The Appel des 30 thus offers complementary solutions, facilitating the setup of new activities through assistance (for regulatory affairs, project engineering, funding, etc.) and the building of new synergy between the players involved. On the strength of the experience gained in the first edition in 2014, the public and private partners of the Appel des 30 are today broadening their range of setup and assistance services, to offer project developers the most attractive conditions possible, by providing 20 hectares of land, 50,000 sq. m. of business premises, 33 hectares of productive landscape and 87,000 sq. m. of surface area for photovoltaic production. Industrial companies in the chemicals-energy-environment and cleantech sectors, and their support activities, e.g. transport, logistics and maintenance. They can be major groups, medium-sized firms, SMEs, start-ups, research laboratories, demonstrators, engineering and design firms, etc. Real estate professionals, provided that their application incorporates an industrial project in one of the target sectors.